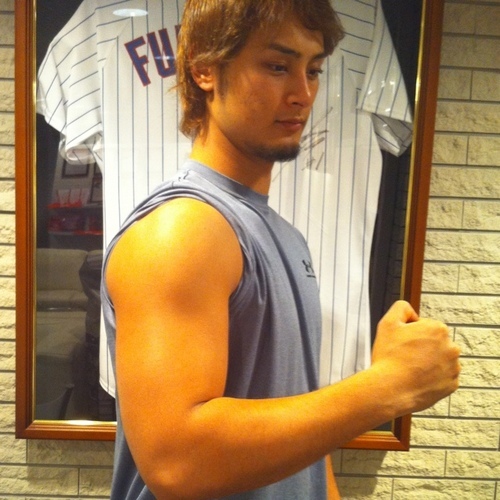 Now that Yu Darvish is officially a member of the Rangers, you can get acquainted with all things Yu. The team will introduce him to DFW Friday at 7pm. TV PLUG: I'll be live from the Ballpark with all sorts of Yu-related coverage. But how can you really learn more about the 6-5 two-time Pacific League MVP? Many ways. Yu is on Twitter and is pretty prolific, posting more than 3800 tweets as of 5:30pm CST Thursday. He's posted a fair amount of pictures, as well. The Google translate tool doesn't quite convey the message of his tweets but on January 15, he apparently tweeted something about the weather and then tweeted something about an Iphone to a follower on the 17th. Riveting, isn't it? Yu has an official website that is simple but visually quite appealing. If you're surfing via Google, you can use the Google translate tool to convert the Japanese characters to English. He has links to a product page where you could purchase "a Black Heart" charm that features "the same uniform number "11" strap featuring an upscale luxurious Swarovski grains" (translate mixup, I think). "The center is equipped with a metal plate logo was designed Darvish." The charm is sold out. 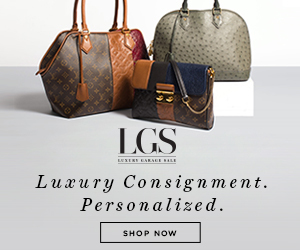 You can purchase Darvish-endorsed cologne but his keychains, tote bags and "strap" are also sold out. Yu also has a page promoting the various charitable causes he supports through the "Darvish-Yu Fund". It appears he donated $1,000 to both the Japan Water Forum and the Children's Welfare Fund for each regular season win. The Water Forum's mission is to solve "water problems in the world". The website links to Yu's blog, which the site calls "Thoughts of Yu". His recent entries include confirmation of his agreement with the Rangers as well the announcement that his divorce is final with Japanese actress, Saeko. I find it interesting that his blog profile shares his blood type. "A", in case you were wondering. Arlington, Texas—The Texas Rangers today announced the club’s individual ticket offers and pricing for 2012. The official 2012 regular season schedule with game times was also released. Individual tickets for all 2012 games at Rangers Ballpark in Arlington, except Opening Day will go on sale at 9:00 a.m. on Saturday, March 3 at the West Box Office, on the internet at texasrangers.com, or by phone at 972.RANGERS. Green Tea + Pepper = Weight Loss Boost? You've probably read about consuming certain foods together to boost that food's health-providing properties. Think broccoli with broccoli sprouts to up the anti-cancer effects or spinach eaten with eggs combines protein and iron and, in turn, increases your metabolism. According to a recent Rutgers University study cited in Whole Living magazine (LOVE that mag!) green tea and pepper is the new power combo to help you lose weight. Sipping the green stuff, along with the spice improves the absorption of the tea's EGCG by as much as 130 percent. EGCG which is the catechin found in tea that has a laundry list of good stuff that can rock your body. So how do you get green tea and pepper together? You're not going to sprinkle it in your tea. Trust me, it's not so hot. How about eating a salad with a liberal helping of pepper with some iced green tea (add mint to the tea for a delicious treat). Try any dish whether it be chicken, fish, even meat followed by a cup of green tea after you finish the meal. The tea acts as a nice digestif. If you're in the cooking mode, you could ladle a cup of steeped tea over a mixture of brown rice and root vegetables. Ok, maybe that's a stretch. The point is, you can get creative with the green tea/pepper combo. It's not that hard to work it in your diet if you do the salad with pepper or sprinkle liberal amounts of pepper on your food while consuming green tea. This is an easy tip that might just do you a weight loss favor without trying too hard at all. Ten-year old Rudy Ramirez was a vibrant, friendly boy. Brain cancer couldn't stop that. 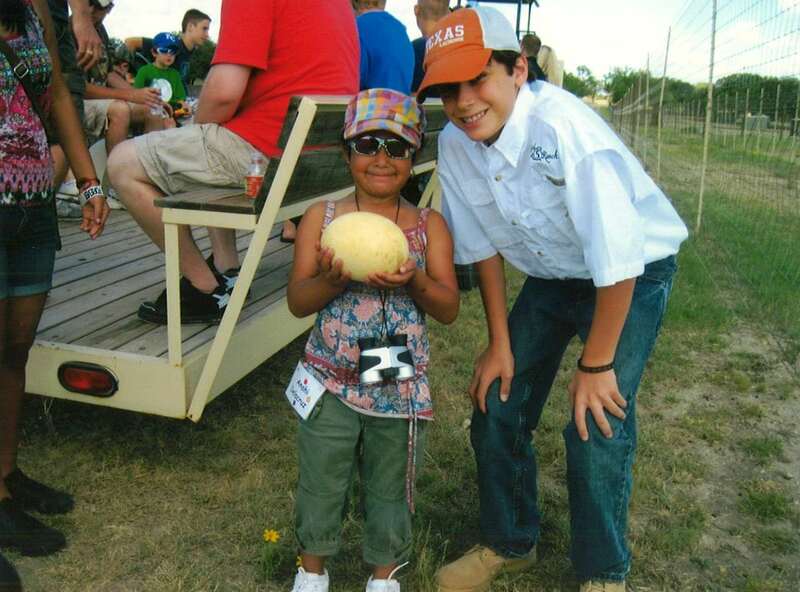 Ramirez made fast friends with Houston native Jake Faust at a retreat for young cancer patients from Houston's Texas Children's Hospital at his grandparents' ranch, Squirrel Creek. "He was really talkative, just like me," 15-year old Jake recalls. "I made a connection with him and stayed in touch. He ended up dying this summer. It just made me realize how fragile life is." The Faust family has hosted week-long retreats for cancer patients for about 20 years. Jake has seen firsthand what a devastating disease cancer is and in 2010 he decided to do what he could to end it. Jake started Autographs for Cancer, a non-profit organization that collects and sells autographed memorabilia online. All of the profits help fund cancer research at Texas Children's Hospital. "I was collecting autographs and I thought that just one autograph from an athlete or celebrity could turn into 300, 400 dollars to help (end) childhood cancer," Jake said. Jake is a one-man autograph army, using a combination of boyhood charm and dogged persistence to get signatures. 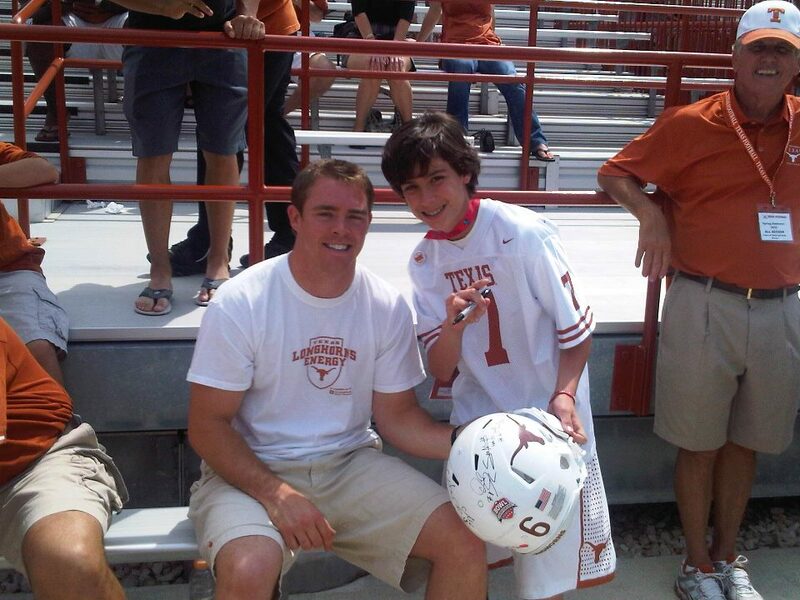 "I've been trying to step up my drive at Astros games and at Texans practices," says Jake. "AutographsforCancer.com Jake Faust is raising $ for cancer by auctioning off memorabilia. Had the pleasure of meeting him at Yankee Stadium." This young Texans and UT fan doesn't discriminate when it comes to getting autographs to sell on his site. His current inventory of autographed gear includes a jersey from Cowboys linebacker DeMarcus Ware, an autographed bat from Rangers second baseman Ian Kinsler, a signed ball from Rangers outfielder Nelson Cruz and an autographed football from Alabama coach Nick Saban. "I just want to help these kids," Jake says. "Over a thousand kids in Texas each year are diagnosed with cancer. I'd like to know that just from my charity alone, even if just 10 kids are saved, that would mean the world to me." "These kids are just trying to live their lives and they get diagnosed with this horrible disease. Everything, from their family life to their school, everything changes because they just got diagnosed with cancer, which they can't help," he adds. But Jake is trying to help so that he doesn't lose another friend, like Rudy Ramirez. You can learn more about Autographs for Cancer and purchase memorabilia by going to Jake's website or Facebook. You can also follow him on Twitter @JakeFaust.